Infinity Countdown is well under way which means…time for some tie-ins! 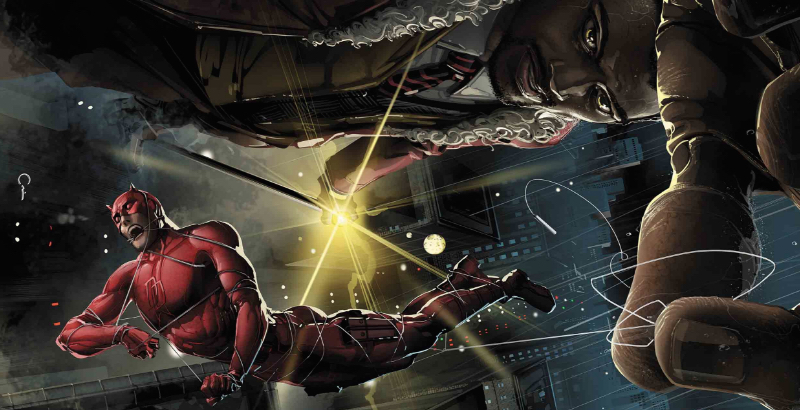 Written by the Infinity Countdown helmer Gerry Duggan, Infinity Countdown: Daredevil 1 focuses on the current owner of the Mind Gem: Daredevil “villain” Turk Barrett. Many readers scratched their heads when it was revealed that low-level criminal Turk was in possession of an Infinity Stone. While Duggan highlights why Daredevil is a good pairing for the Mind Gem, the issue lacks consequence. Duggan and artist Chris Sprouse juxtapose Turk’s new mind-reading abilities with a young Matt Murdock’s first experience with his radar-sense. Where Matt’s heightened sense of hearing overwhelmed him, Turk doesn’t seem to have much trouble at all adjusting to the cacophony of thoughts that he can hear. Matt stumbles upon Turk at the courthouse, a setup that has the potential to provide some high stakes secret identity drama. This all takes place before Matt knows that Turk has the Mind Gem — so instead of having him flee in fear of having his thoughts heard, Matt abruptly leaves because…he doesn’t want Turk to remember he stabbed him way back when? It’s an odd excuse to get Matt out of the mind reader’s grasp and sidesteps a conflict by referencing a happenstance from the Frank Miller days. When Matt throws on his tights and eventually does figure out that Turk has a “magic cane” controlling people’s thoughts, Turk promptly makes him forget that fact. Earlier in the issue we saw indication of Turk using his power with blue thought bubbles. When he commands Daredevil to forget however, that particular blue flourish is curiously missing. 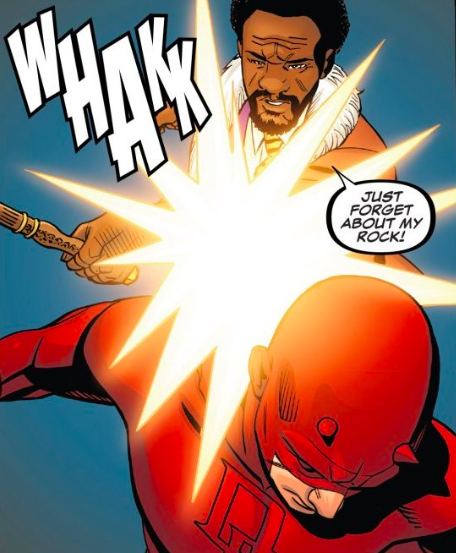 It’s only on the next page when Daredevil’s radar sense can no longer detect the stone that we see Turk had used his power to make him forget. Thus making everything that happened in the issue…moot? Man….. this might be the most edgiest statement I have written (off-topic btw) and I’m truly sorry if its sounds offensive and upsetting. I wish the general public sick of mainstream superheroes movies even it is great and Marvel and Dc should stop publishing superhero comics and just publish creator-owned comics. The first statement have personal reasons that involves certain individuals while the second statement is clearly because of my frustration of Marvel and Dc (especially Marvel) to be able to move forward and eventually always panders to those that dislike change and unable to be more creative. Eventhough both of them have comics that is diverse and creative eventually it will be irrelevant in the future. There’s no consequences in terms of storytelling in big two and how both of them market their products. Not only that but both fandoms just want one thing : More of The Same. I admit I writing this because I personally frustrated that a certain franchise might never be able to get the mainstream attention again and will be lost in obscurity.